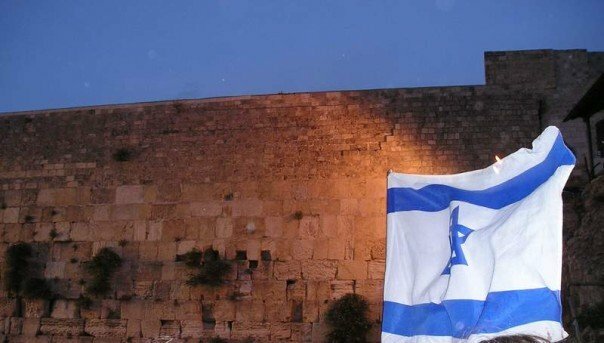 The 28th of Iyar, 5727 (June 7th, 1967), was a historic day for the Jewish people. It was the day our eternal capital, Jerusalem, was reunited, and we regained access to our holiest site–the Temple Mount. Yes, I said Temple Mount. Because while the Western Wall is generally known as being the holiest site in the world for Jews, that isn’t actually true. The Western Wall was just the retaining wall of the platform on which Herod’s renovated Second Temple stood two thousand years ago. What was so important to us was the Temple itself. I keep mentioning this Temple, and it’s been many years since I explained to you what it was. So in honor of Jerusalem Day, which we will celebrate this coming Sunday, let me tell you the story of the Temple and of Jerusalem. After we received the Torah at Mt. 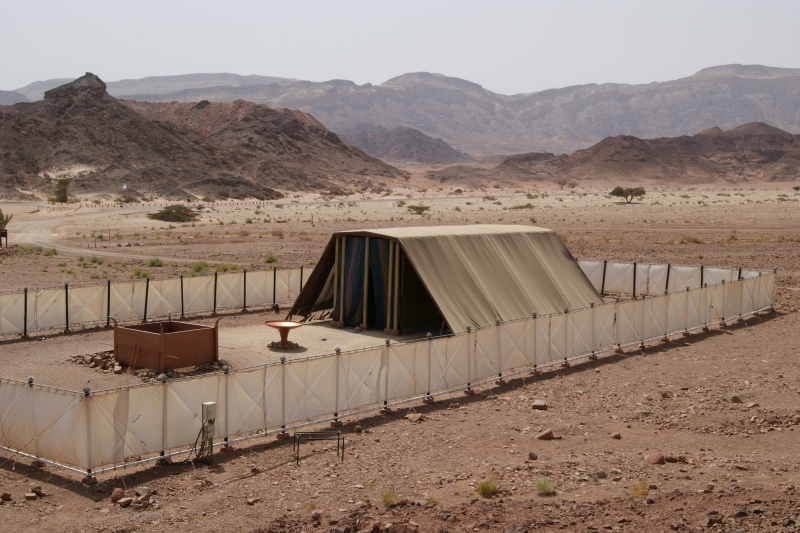 Sinai–an event on which I will elaborate soon, as Shavuot is right on the heels of Jerusalem Day–God commanded the Israelites to build something called the Mishkan, the Tabernacle. (“Mishkan” means “dwelling place”.) It was a sort of portable structure that contained a courtyard and a tent (the Tent of Meeting). This is a model of the Mishkan at Timna Park, near Eilat, Israel. “Stiftshuette Modell Timnapark” by Ruk7 – Own work. Licensed under CC BY-SA 3.0 via Wikimedia Commons. The courtyard contained the Copper Altar, which was used for the ritual sacrifices that were made there regularly as part of our service of God, as well as the washstand (for ritually washing hands–that’s where our tradition of washing before eating bread comes from!). The Tent of Meeting contained two chambers. The outermost chamber was called the “Kodesh” and contained the Menorah (elaboration in this entry), the Table with the 12 “showbread”, and the Golden Altar (for incense). 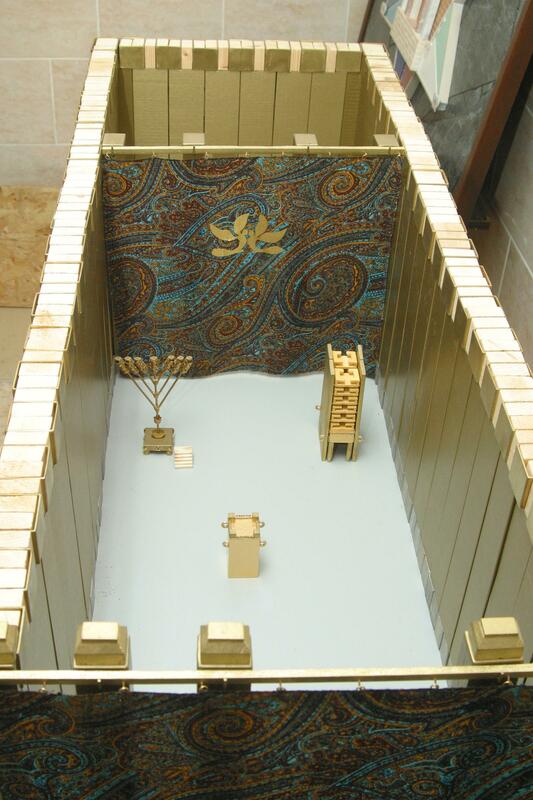 This model shows the “Kodesh”, the outer chamber, with the Menorah, the Golden Altar in the middle, and the Table. “Mishkan5 big” by Daniel Ventura – . Licensed under CC BY-SA 3.0 via Wikimedia Commons. The innermost chamber was called the Holy of Holies, and as the name implies, it was the holiest place on earth for us, wherever it was at the time. Only Moses and Aaron were permitted to enter, and only at designated times; and after their deaths, only the High Priest could enter, and only on Yom Kippur at a specific time during the service. What was so special about this place? 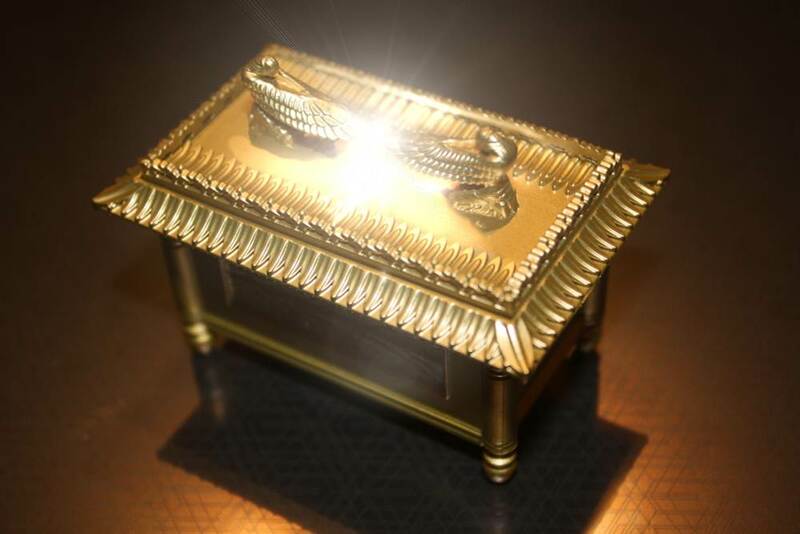 It contained the Ark of the Covenant, the gold-plated box that carried the original Tablets of the Covenant that Moses received at Mt. Sinai, upon which the Ten Commandments were inscribed. The Ark of the Covenant, based on the model used by the filmmakers of Indiana Jones: Raiders of the Lost Ark. We carried the Mishkan with us through the desert, and eventually, when we settled in the Land of Israel, the Mishkan was set up permanently, not in Jerusalem, but in Shilo. Shilo is a little town in Samaria, and recent excavations there are uncovering what may very well be the place where the Mishkan once stood. (This is one of Eitan’s favorite places to take tourists. It’s an amazing site.) Samuel the Prophet was conceived after his mother Hannah prayed at the Mishkan in Shilo, and he was raised there by the High Priest, Eli, until he became a prophet. (See the opening chapters of Samuel I.) Samuel was the prophet who crowned the first kings of Israel: Saul and David. It was King David who first raised the idea of building a Temple, a permanent structure for the Mishkan. “See now,” he said to Nathan the Prophet in Samuel II 7:2, “I live in a house of cedar, and the Ark of the Lord dwells within curtains.” God, however, did not want David to build His house, and the Sages say that this is because David fought many wars and “his hands were stained with blood”. God wanted the Temple to be built in a time of peace. So He promised David that he would have a son who would continue his dynasty, and that son would build the Temple. And that is what happened. King Solomon, son of David, built the First Temple in Jerusalem on the Temple Mount. 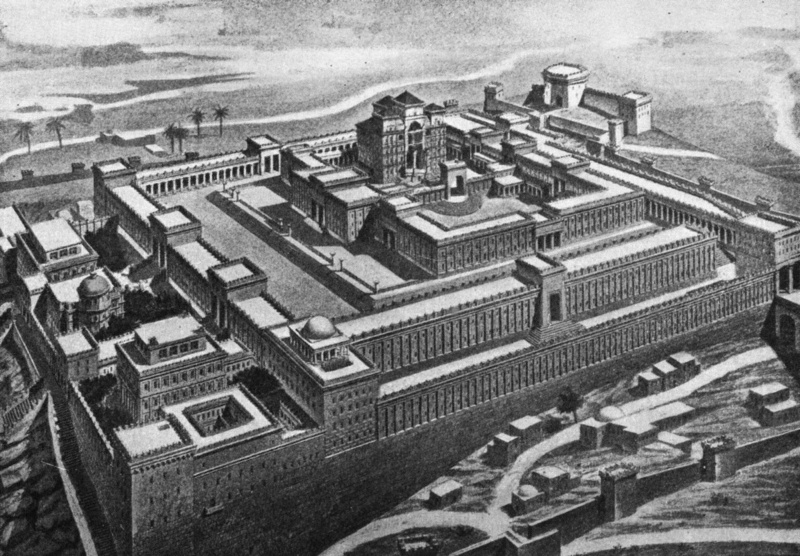 Religious scholars place its construction at around 832 BCE. A drawing of the First Temple based on descriptions from the Bible. Let’s back up a second here. We’re talking about the world’s first monotheistic religion, the first religion to worship a single, omnipresent God who was not manifested in any physical object or person. So why would we center our worship of Him around a physical building, and the physical objects therein? Isn’t that a little too much like the idol worship we were supposed to be obliterating? When instructing Moses on the construction of the Mishkan, God said, “They shall make for me a Temple, and I shall dwell within them” (Exodus 28:8). Notice that He didn’t say, “dwell within it“. The idea was not for God to manifest Himself in a physical object or place. He said “dwell within them“–the People of Israel. The Mishkan was not for Him, it was for us. It was meant to orient us towards Him and His service, so that awareness of Him would dwell within us. We never worshiped the building or its contents. They were tools that we used to worship God. The Temple was the place where God and man embraced, where the limited physical reality of human existence touched the eternal. The very physical work that involved the service of the Temple–the sacrifices, the contributions, the incense, the rituals–were a way to tangibly connect with God. And that is why, originally, our entire religion, our entire service of God, centered around the Temple. The first mention of Jerusalem in the Bible, according to our tradition, is in Genesis 22–Mt. Moriah, where Abraham brought his son Isaac to be sacrificed. It came under Israelite control in the time of King David, who captured it from the Jebusites. The name Yerushalem or Yerushalayim first appears in the book of Joshua. The source of the name is unclear. Our Sages teach that it is a combination of the name Abraham gave the site of the (aborted) sacrifice of Isaac, “[Hashem] Yira’eh” (“God will show Himself”), and the town of “Shalem”. The root sh.l.m. (ש.ל.ם) means “peace” or “whole”. King David made Jerusalem the capital of the tribe of Judah, and of the Kingdom of Israel. Aside from the mystical implications (Isaac’s sacrifice and Abraham declaring that spot a place where God will show Himself), this was a highly practical choice. It was a defensible mountain on the border of Judah and Benjamin, close to the center of the kingdom, with the necessary water sources and a good climate for agriculture. Jerusalem is also known as Zion, Ir HaKodesh (“the Holy City”–or in Arabic, Al-Quds), and the City of David, among others. Here’s the thing, Josep. Judaism, as a religion, has undergone great changes in the thousands of years it has been around. And the biggest changes were a result of the destruction of the Temple, which forced us to shift from a service that centered around that physical space, to a “portable” service that we could carry with us throughout exile. The significance of this shift, and the fact that it was able to happen at all, cannot be taken for granted. As I mentioned, when the Temple stood, our service of God looked very, very different from the way it looks now. Animal and produce sacrifices and contributions were made regularly and for varying reasons and purposes, some of which were burned on the (copper) Altar and some of which were consumed by the Priests (Cohanim) or the Levites. The three major holidays were characterized by a nationwide pilgrimage to Jerusalem. All men were required to make that pilgrimage at least three times a year. This is what the “original Judaism” looked like. When the First Temple was destroyed, the leaders of the Jewish community had to figure out how to keep Judaism alive in Babylonia. It was then that the institution of the synagogue was first established. As I mentioned in the entry about the Jewish holy books, when we were granted permission to return to Jerusalem and rebuild the Temple, the leaders Ezra and Nehemiah established a number of practices to keep Jews connected to the Torah and to the Hebrew language. 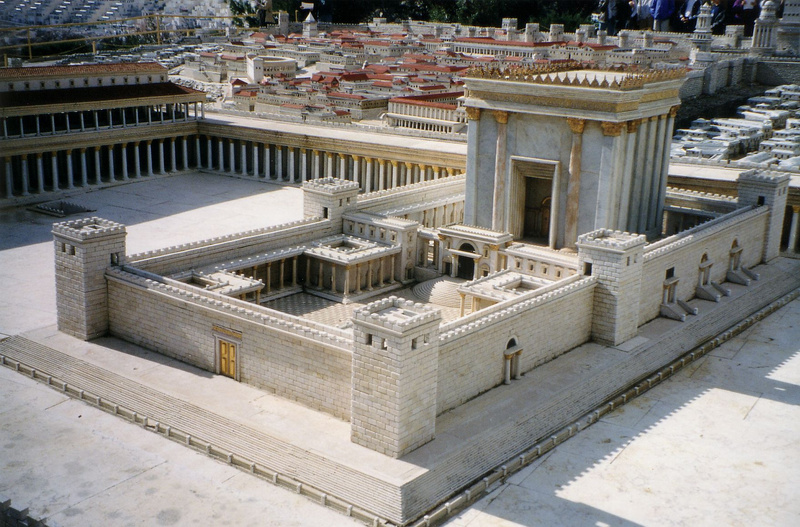 The Second Temple was built under their leadership. It was that Temple that was defiled by the Greeks and rededicated by the Maccabees. The building was later expanded by King Herod under the Romans. Jesus was born while it still stood, and it was destroyed by the Romans 70 years after his birth. After the destruction of the Second Temple, Judaism encountered another huge crisis. The study and transmission of Jewish Law was forbidden under Roman law, and great teachers risked–and gave–their lives to continue teaching and passing on the tradition. 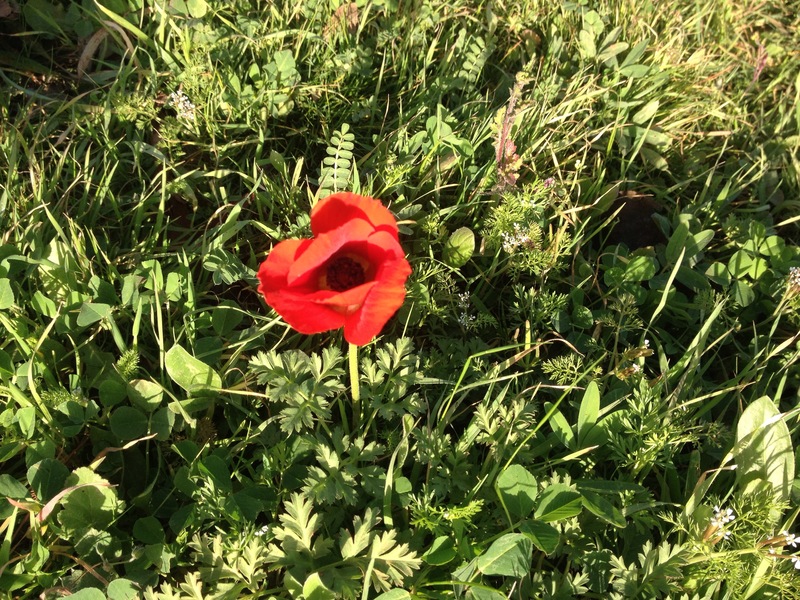 The framework of halakha that we use today to apply the Law to current circumstances was solidified during this period. The Oral Law, which was originally not supposed to be written down, was nonetheless preserved in writing in what eventually became the Talmud. The global center of Jewish thought and development now shifted to Babylonia and the great schools of Sura and Pumbedita. Jews continued to live in the land of Israel wherever they were allowed until the modern era, but the ritual practice of Judaism had successfully adapted itself to exile. The month after Shavuot, we will enter a period of mourning for the Temple that has been practiced and preserved throughout the Jewish diaspora. The Ninth of Av, the day the Temples were destroyed, is still the saddest day of the Jewish year, and a major fast day second only to Yom Kippur. For two millennia, Jews prayed and cried at the remaining wall of the Temple, which became known as the Western Wall, or the Wailing Wall. In Israel, we simply call it “the Kotel”–“the Wall”. Le mur des lamentations d’après, Alexandre Bida (1813-1895). 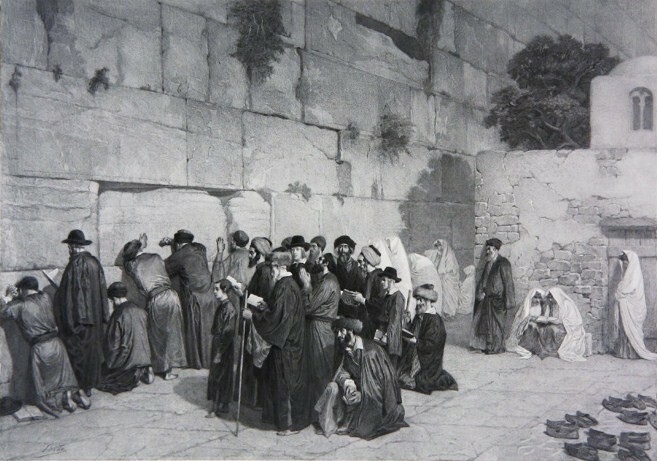 A painting depicting Jews praying at the Wall around the year 1880. A picture I took at the parade in 2004. You’ll notice the crowd is mostly comprised of dati leumi (religious Zionist) Jews. After the war, the Israeli government handed the keys to the Temple Mount over to the Waqf, the Muslim authority of the Al-Aqsa Mosque. The idea was to maintain freedom of worship on the holy site, which is a given for any democratic country, and Israel is no exception. Muslims and Christians alike are granted free and unrestricted access to any holy site under Israeli jurisdiction. Unfortunately, the Waqf does not share this philosophy. Jews and Christians are only allowed to visit the Temple Mount through prearranged agreement, with organized groups and under careful supervision. We are not allowed to pray on the Temple Mount, nor to bring any written material, lest it be some kind of religious text. Theoretically, these rules apply to any non-Muslim, but practically, Jews are singled out for severe treatment. Jews are kept in a small, closely accompanied groups, and are continuously heckled by Muslims shouting at them wherever they go on the Mount. (Hamas actually pays people a decent monthly salary to stand around and harass the visiting Jews.) Numerous Jews have been detained for the “crime” of standing silently with their lips moving. A rabbi was recently forcibly removed from the premises for responding “Hashem hu ha’Elokim” (“The Lord is God”) to a man who shouted “Allahu akbar” (“God is great”) at him. The situation is completely absurd. To me it is so ironic that what is actually the holiest and most important site for Judaism is the only place in Israel where the basic human right to religious freedom does not apply to Jews (or to Christians). And it is absolutely infuriating to me that this is the status quo and that this issue is not even part of the discussion about the Israeli-Arab conflict. The unrest that erupted in Jerusalem this past fall were partly due to a rumor spread among the Muslims of some kind of Jewish plot to take over the Temple Mount. We don’t want to take over the Temple Mount. We just want to be able to visit and pray there freely. The Cave of the Patriarchs in Hebron is holy to Jews and Muslims alike, and there is a perfectly acceptable arrangement there that allows people of both religions to pray and worship there without incident–despite the fact that Hebron is also a focus of great political controversy. It is beyond me why a similar arrangement at the Temple Mount would be so offensive and threatening to Muslims. Amen, may it be His will. I have always had a thing for trees. When I was six years old, I learned about the rainforests and the importance of trees in the ecosystem, and became completely obsessed with these topics. When my parents and grandparents would take me to a bookstore, I always wanted something about rainforests or trees, the kind with the big, glossy pictures. I loved trees. I would hug them, and put my face right up to the bark and breathe in their scent. (…If it were socially acceptable, I would totally still do this. 😛 ) I saw them as my friends and enjoyed their “company”. I knew all about how they grew, and how the leaves used chlorophyll to convert light into energy, and how it was the loss of that chlorophyll that made them change color in the fall. In my childhood in northeastern America, I had a favorite tree: the maple tree. 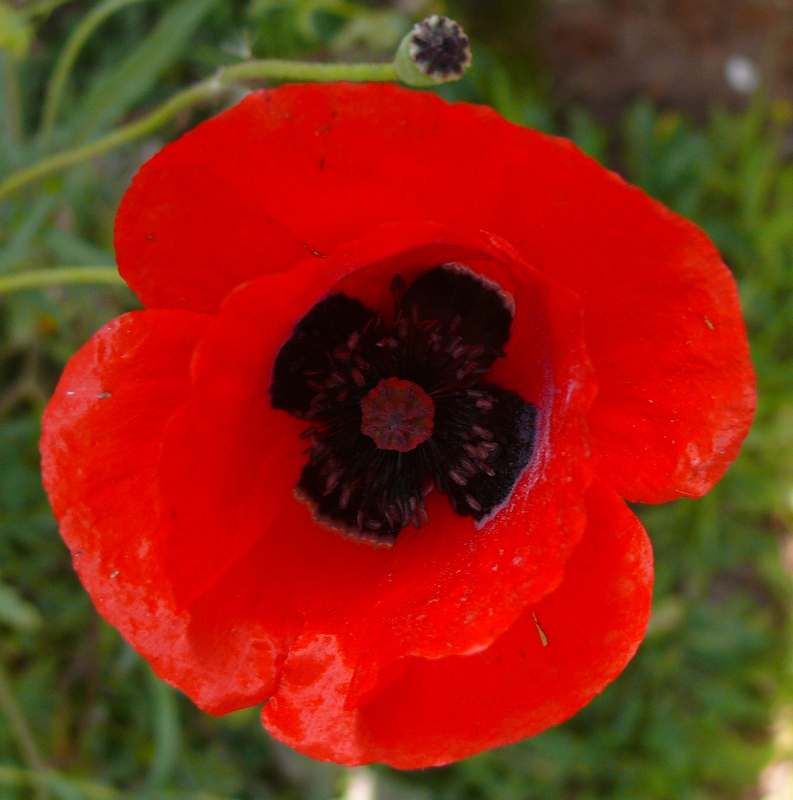 (The one with the signature leaf that appears on the Canadian flag.) I loved its broad, star-shaped leaves, its sturdy trunk, and most of all, the smell of its autumn leaves: the brilliant reds, oranges and golds that carpeted the ground. I think that scent is one of the things I miss most about America. 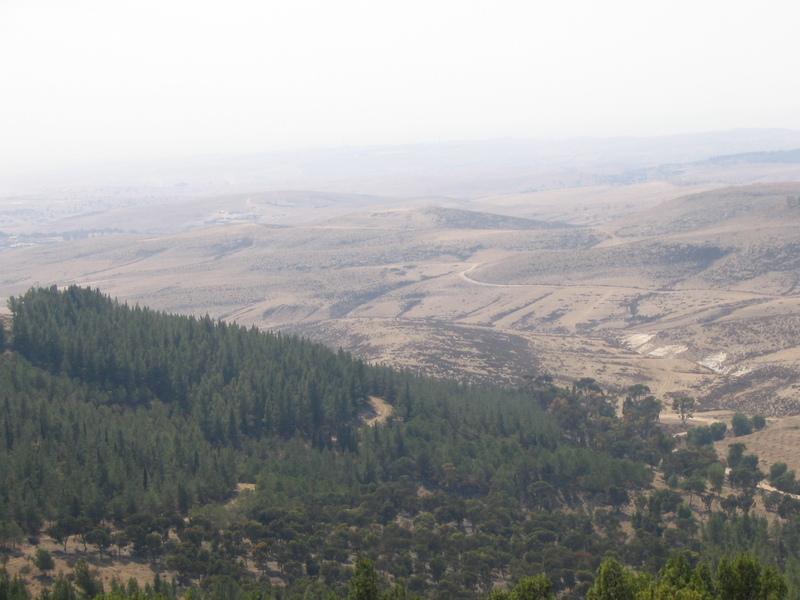 This is the Yatir Forest, the largest planted forest in Israel. “Yatir Forest, Israel no.1“. Licensed under CC BY-SA 3.0 via Wikimedia Commons. The trees that grow naturally in this region are less flammable because they grow more slowly and are much denser. 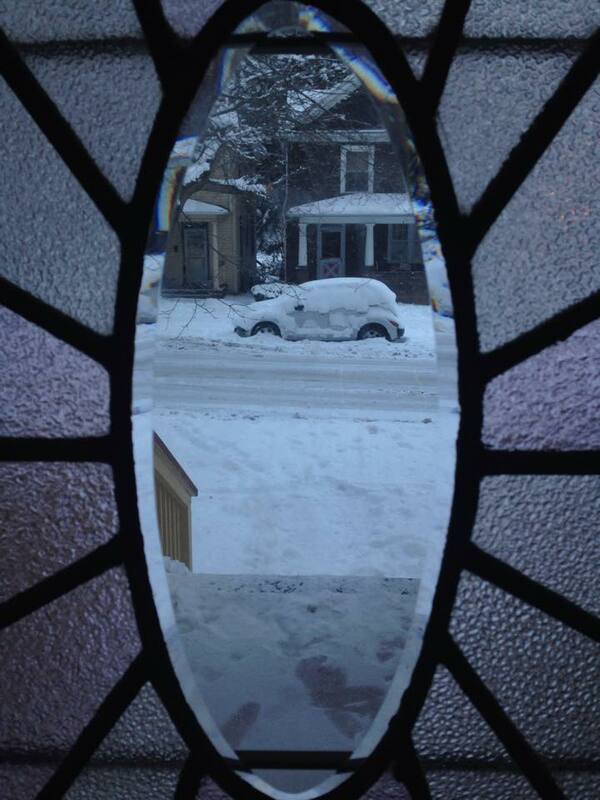 There’s an allegory in there somewhere. 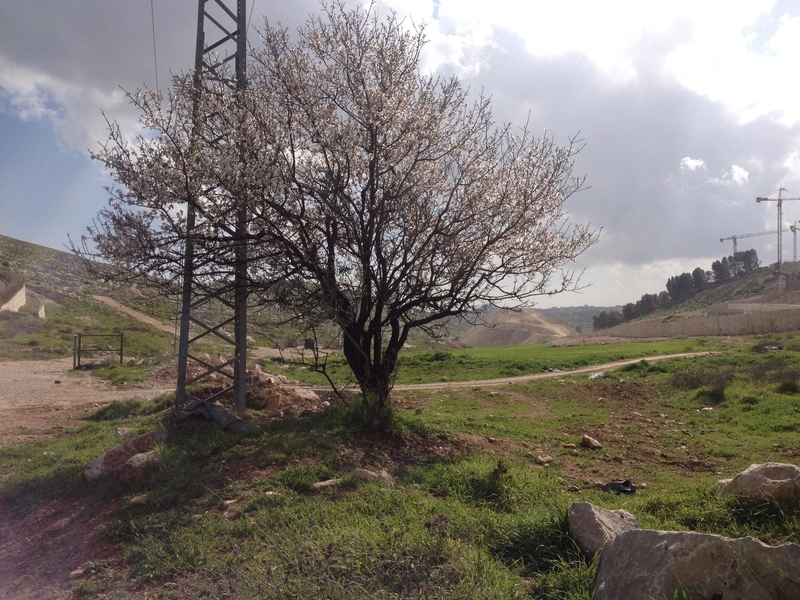 In any case, planting and honoring trees is an ancient Jewish tradition. In Deuteronomy 20:19 there is a specific commandment not to destroy trees for no reason while besieging a city: “For is the tree of the field man, that you should besiege it?” This is a rhetorical question in the text, but removed from its context, this phrase: “כי האדם עץ השדה”, reads: “for man is the tree of the field”, and has been used thus allegorically. The Talmudic rabbi Yohanan Ben Zakkai taught that if the Messiah comes while a person is planting a tree, he should first finish planting the tree, and then go greet the Messiah. I would probably say that my favorite trees are are now almond and olive. 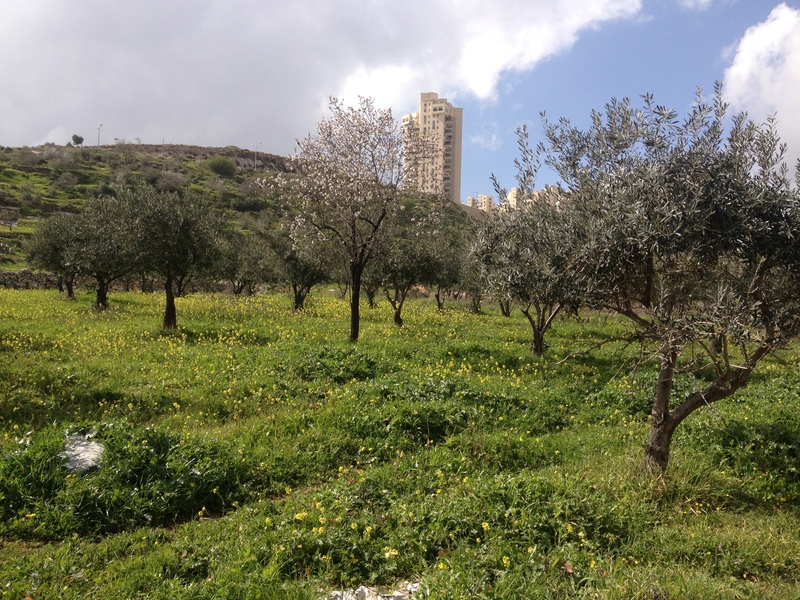 The almond tree for its beauty during flowering season, and the olive tree for its character. You have olive trees in Catalonia, so you must know what I mean. There’s something about its ancient, gnarled trunk, its characteristic elliptic leaves, and the deep symbolic significance it has acquired over the thousands of years of history so rich within this soil. And look how they both posed for me so nicely. 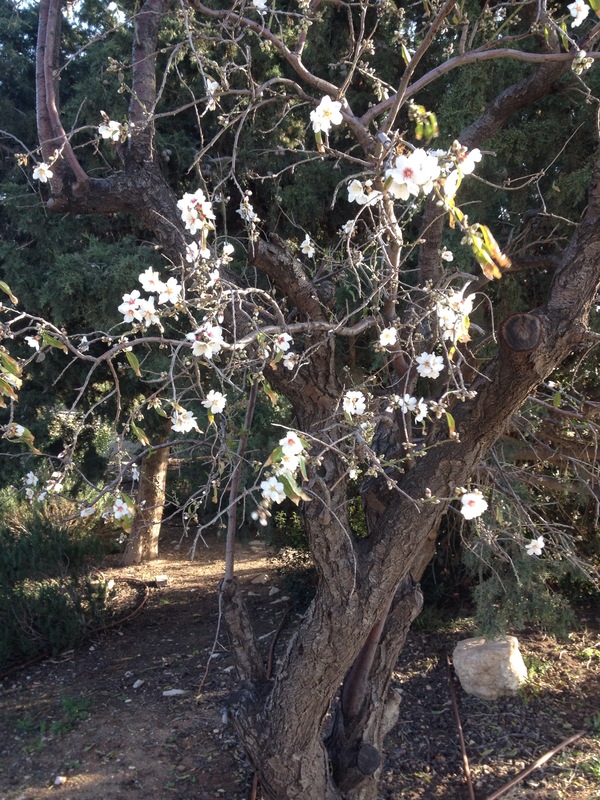 An almond tree in the middle of a young olive grove in the outskirts of Jerusalem. So I guess it is not a big mystery that Tu B’Shvat, the New Year for the Trees (as explained here), has more significance in Jewish tradition than simply a technical beginning to an agriculture year. We love trees, and see them as a way to connect us to the land and to our privileges and responsibilities regarding it. 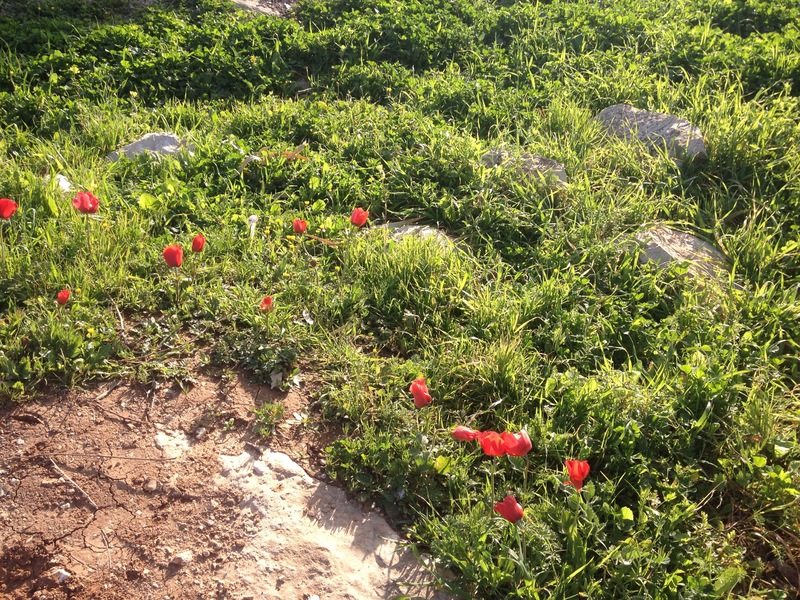 This year, because of shmita, we can’t plant them, but we can still celebrate them. Yesterday I got a call from my friend Abi. She said she hadn’t been to the Kotel in too long and she wanted to go. Could I come? So I ditched all my psychometric exam studying, picked up my things and hopped on a bus to Jerusalem. Because when you’re Jewish, and you live in Israel, you have to remember that one of the things about living here that no other Jew in the world has is the ability to just hop on a bus and go to the Western Wall. 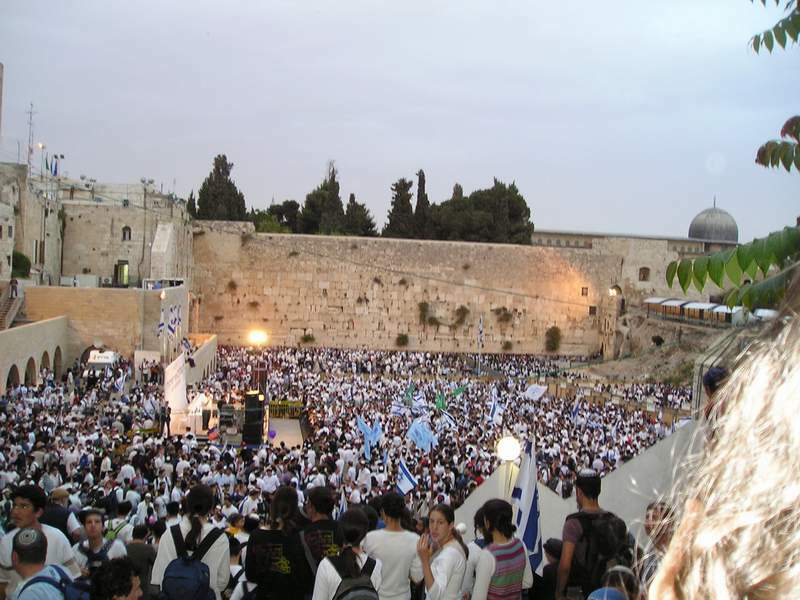 Which is what I did, spontaneously, on Jerusalem Day of 2005, resulting in this amazing picture. You probably know all about the Western Wall, but here’s an elaboration for ya. The Western Wall (known as the “Kotel” in Hebrew, which means “wall”… and as the Wailing Wall) was an outer wall of the Herodian Temple (the second one). It, along with the Southern Wall discovered relatively recently, is the only remaining structure from the Temple, so it’s considered the holiest site forJews. (The Western Wall is more important to us because it has been there throughout the centuries, the one piece of our Temple we could pray to the whole time. I remember Abi saying that soon, God willing, we would be praying to the Third Temple; but I said that I think we will still retain a lot of respect and awe for the Western Wall as the only part of the Temple that stayed with us throughout the entire Diaspora period.) Of course, the Temple Mount is holier, but the Muslims took over and built their stuff on top, officially removing all chances of Jewish excavation to discover solid proof and further artifacts from the Temple. *grumble grumble* Anyway, all Jews pray in the direction of where the Temple once stood. Outside of Israel we pray towards the east; inside Israel, in the direction of Jerusalem; in Jerusalem, in the direction of the Kotel. All Jewish faces are turned to this one spot when they pray. There is a custom that when one hasn’t seen the Kotel in 30 days and sees it again, s/he rends his/her clothes in mourning. Instead of ruining perfectly good clothes, I brought along a headscarf for the purpose and wore it as I walked towards the Kotel. When it came into sight, I whispered, “Im eshkachekh Yerushalayim, tishkakh yemini, tidbak l’shoni l’chiki im lo ezkereikhi, im lo a’aleh et Yerushalayim al rosh simchati” (“If I forget thee, Jerusalem, let my right hand forget its cunning, let my tongue cleave to the palate of my mouth if I do not remember thee, if I do not raise Jerusalem above all my joy.”) and tore the corner of the scarf as a symbol of my mourning for the Temple. We walked to the women’s section and passed by the praying women to stand near the Wall. There’s something about the Kotel you just can’t describe in words, Josep… one day, with God’s help, I will take you there and you’ll understand what I mean. The silent reverence all around, broken only by the sniffles of passionate tears and whispers of prayer and the occasional wail… the cool Jerusalem breeze… the rustling of the plants sprouting from the cracks in the stone… and the cool, smooth stone itself, softened by the wind and rain and tears of two thousand years… and the doves that live in the larger cracks coo during the prayers, and sometimes you’re not sure if it’s one of the people crying or a dove. But maybe it doesn’t really matter. You were on our minds for much of the way. I guess there’s just so much I wish I could show you! And you know what’s awesome? 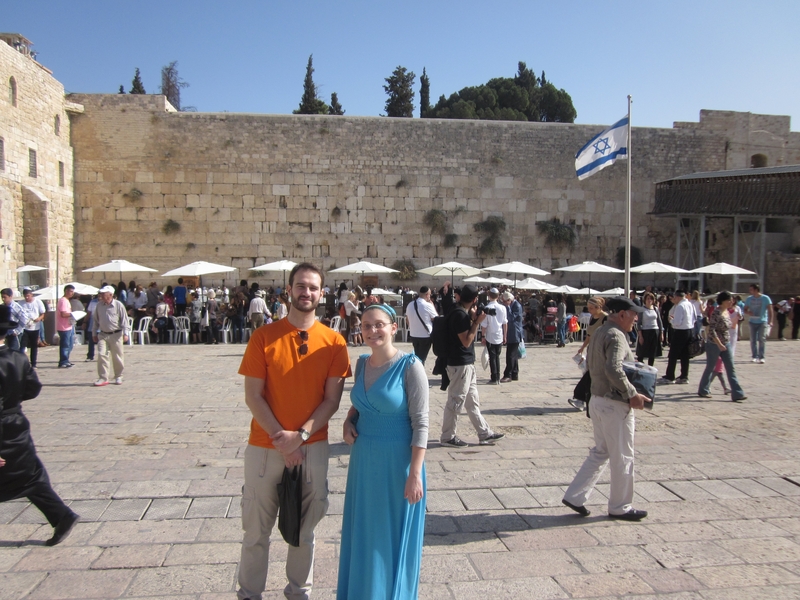 I did actually get to take him to both the Kotel and that bookstore… 6.5 years later.